Are Craft Breweries in Colorado Reaching the Saturation Point? The number of breweries in the United States is at an all time high in 2016 with just over 4,656 and there's nearly half more of that in the process of opening in the next year or two. 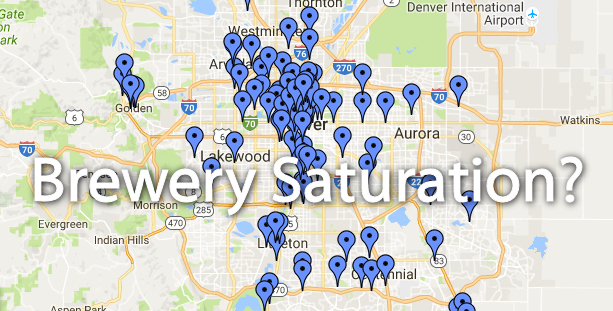 Colorado alone has more than 300 craft breweries open at present with dozens more in the works. Some cities, like Fort Collins, Colorado, have as many as 1 brewery open per 7,600 people, a number that far exceeds the national average. How many breweries can one Colorado town support? How many breweries can open before we reach the limit? Why do we have so many breweries today? When will the craft brewery bubble burst in Colorado? The answers to these questions and others are certainly not easy to answer. One way to try to answer these questions is to examine where Colorado is now, look at the brewery nation as a whole, and to examine what lies ahead. Colorado is no stranger to craft breweries. The very first craft brewery, Boulder Beer Company, opened in 1979, the same year that President Jimmy Carter signed bill HR1337 repealing Federal restrictions on homebrewing in February 1979. In the 1980's, Colorado had just a handful of "craft" breweries. In the 1990's a few dozen more were open. And by the mid-2000's Colorado had just over 100 craft breweries open. Just a decade later, that number swelled to somewhere just over 300 craft breweries. And while there are still dozens of Colorado breweries in the process of opening in the next year or two, the rate of adding on has started to slow. Hence all the questions on whether Colorado has reached a saturation point or not. Colorado had roughly 5.45 million people living here as of July 2015, up 1.89% since the year before. Roughly 2/3rds of those people are of legal drinking age. Northern Colorado alone - broken down by county: Boulder County had roughly 319,000 people, Larimer County had 332,000 people and Weld County had 285,000 people - or nearly 936,000 people. Today's estimates put Colorado's 2016 population at around 5.55 million people and about 953,000 people in Northern Colorado. So with just over 300 breweries, that's roughly 1 brewery per 18,000 people in Colorado. In 1873, there were 4,131 breweries in the US with nearly 39 million people in the US (1 for every 8,000 people). That number fell all the way to 0 breweries in 1920 when prohibition hit. After prohibition, that number slowly, and I mean SLOWLY, grew. There were just 89 breweries in the US by 1978 when homebrewing became legal again. But as of 2015, the numbers ballooned to 4,269 breweries with 330 million people (1 for every 77,000 people). So in comparison, today was have 9 times the population of 1873, but just over the same amount of breweries. So in order to equal 1873's people to breweries ratio today, we'd need to have over 41,000+ breweries opened. Think there's room for more? In 2015, Colorado had roughly 7.3 breweries per 100,000 adults age 21+. That ranks 3rd in the nation just behind Oregon (7.7) and Vermont (9.4). Some states has less than 1 brewery per 100,000 adults. So while Colorado is near the top of the charts, it seems that there may be still room for more according to Vermont's statistics and historical statistics. Craft beer accounted for 12.2% of total beer production in 2015 (24.07 million bbls), up 12.8% over 2014. National beer production (craft and macro) fell 0.2% in 2015 over 2014 (196.7 million bbls). So while total beer production in the US slightly fell, craft beer production is still growing at a health pace. Back during the Gold and Silver rush of the mid to late 1800's in Colorado a small mining town had roughly 1 brewery per 1000-1200 people, and that was sustainable - for a while at least. But as the boom went bust, that number dropped off quickly. So as long as jobs and the local economy held out, a town could sustain quite a high ratio of breweries per capita. More statistics: The current US average: 1 brewery per 75,000 people. Colorado: 1 brewery per 18,000, about 4 times national average. 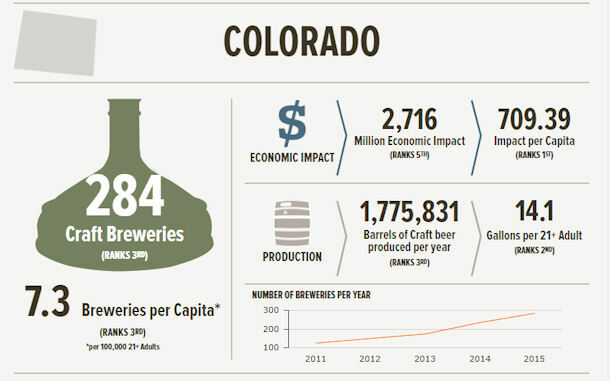 For for the rest of the country, it seems they have a lot of room to add more craft breweries, but does Colorado? We face a period of great uncertainty now. The 2016 Presidential Election has many concerned. The Economy is still moving in a mixed direction. The world is facing many crisis's. The scarier things get, the more people tend to drink alcohol. While that may sound like a good for breweries, that's not necessarily good for those planning to open a new brewery. Arguments for bubble bursting: The rate of expansion is slowing noticeably over 2014. Overall beer consumption in US is starting to go down as people look to alternatives: hard cider, hard liquor, mead, & wine. Some cities in Colorado have an unbalanced ratio of people to breweries. It's getting harder to find a unique brewery or beer name that isn't being used - just look at the number of lawsuits involving trademarks that breweries are in today. The number of breweries in planning is decreasing and the number who fail to open or abandon efforts after starting the process is going up. But what really defines if there is still room for more breweries? Quality of product has a lot to do with it. The general population's curiosity for variety is another. The general desire to find and try something new is yet another. The desire to travel and explore is another. And you can always examine the local economies of individual Colorado towns. One thing's for sure whether times be good or bad, people are always wanting to drink beer and they don't always want to drink the same thing. So while we may not have all the answers, it does warrant further examination. What do you think? Does your town or neighborhood have room for another craft brewery? Share your thoughts on the Fermentedly Challenged Facebook Page. - Brewers Association (Boulder, CO). [Press Release] Boulder, CO • July 26, 2016—Craft brewers are still growing, according to new mid-year data released by the Brewers Association (BA)—the not-for-profit trade association dedicated to small and independent American brewers. American craft beer production volume increased eight percent during the first half of the year. As of June 30, a record high of 4,656 breweries were operating in the U.S, an increase of 917 breweries over the same time period of the previous year. Additionally, there were approximately 2,200 breweries in planning. Craft brewers currently employ an estimated 121,843 full-time and part-time workers in a variety of roles including many of manufacturing jobs, all of which contribute significantly to the U.S. economy. Looking for a great Colorado beer bar in the Boulder - Longmont area? If you want variety and selection - Boulder County not only has some of the best craft breweries in the state but also has some of the best beer bars around. The cities of Boulder, Longmont, Louisville, Lafayette, Lyons, and Niwot Colorado have a multitude of fine eating and drinking establishments with large craft beer selections to choose from. Whether it be fresh on tap or from a great collection of local, domestic or import beer in bottles - these places won't steer you wrong. Note: Local breweries have purposely been kept off this list. In addition, chain restaurants such as Old Chicago, Buffalo Wild Wings, The Tilted Kilt and East Coast Pizza have also been kept off the list as you can find those all across America. This list focuses on the area's unique beer bars, pubs & restaurants only. Over 68 world-wide & craft beers on draft plus over 300 bottled beers. Daily Happy Hour 3-6pm with $1 off drafts. Big food menu too. 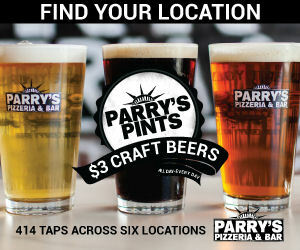 Over 21 craft beer taps - original location - big outdoor patio - hand crafted pizzas. Many beer events / takeovers. A community pub serving great American pub food with vegan and vegetarian selections and a variety of craft beers. Around 10+ rotating beers on tap. Owned by Oskar Blues - 40+ craft beers on tap including 12+ of their own - Blues-themed restaurant with live music regularly. Featuring 100 taps of the best craft beers available from local, regional and worldwide. Serving up some of the best pizza, wings and calzones around. 20 craft beers on tap, many more available in bottles. One of the best places for BBQ in the Boulder County area. Upscale restaurant with a cocktail bar (Upstairs). 5 taps and 50 bottled beers. Frequent access to hard to get beers. Beer dinners. 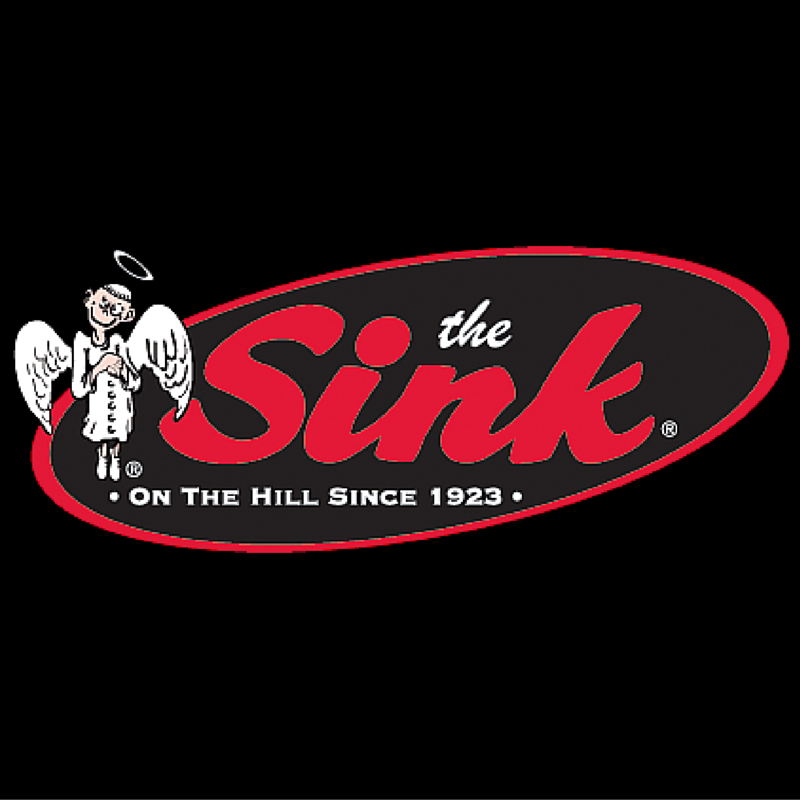 Long-time established restaurant with 18+ beers on tap including featured locals, plus a variety of bottled beers. Award winning classic American tavern with great craft beer selection - 25 draft beers, 25 bottled beers and even 75 bourbons. Satellite Tap Room every 1st Thursday of the month.